… as I have even started buying flour through them! Following my breadmaking course in December, I haven’t had many hands-on sessions. I’ve used the bread machine for convenience when busy, but was determined to start making it by hand again, as what I made on the course tasted so good. Finally, I got around to making a batch, and then another, and what I was producing was good, but not to the same standard, by a long chalk. I came to the decision that the issue was flour. If I use supermarket flour, I tend to buy Allinsons, which I find reliable, but uninspiring. I’ve decided I don’t like Dove Farm flour, as I have had very inconsistent results in the past. What we used on the course was stonemilled, unbleached white, and some wholemeal. 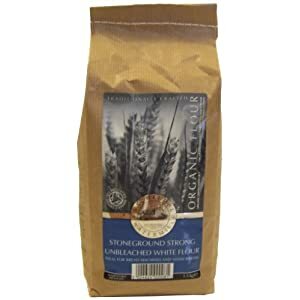 At one point, a few years ago, I used to buy a stonemilled flour at a place in Spalding, but the last couple of times I’ve been out there, they haven’t had what I wanted. Which is how I came to be buying flour from a welsh watermill, via Amazon. It seems perverse, but recently I’ve made the best bread ever. Even using it in the breadmachine, it is coming out superb. Bacheldre Watermill Organic Stoneground Strong Flour us unbleached, which results in a brown looking bread, even though it is technically white. A pack of 4 1.5Kg bags is costing me 8 quid, including delivery, which I think is pretty good, considering what it is producing. I am a little alarmed about what this must be doing to my food miles, but at least it has confirmed to me what my problem was. Perhaps I should start looking for a local product with similar properties, now I know what I want. Previous Post How big a screen?